Recently, Media Heritage’s Mike Martini embarked on a road trip to the St. Louis area to visit Linda Lupton Hern and accept the gift of a portrait of Candy Newman. Cincinnati radio and television fans certainly remember Ruth Lyons—perhaps the most influential local broadcaster of the 20th century. Candy Newman was Ruth’s daughter and Linda was Ruth’s niece and the last living member of Ruth’s immediate family. Ruth Lyons was a broadcast dynamo in radio in the 1930s at Cincinnati’s WKRC, becoming one of the nation’s first female program directors. On WLW and WLWT television in the late 1940s into the 1960s, Ruth’s daily “50-50 Club” program dominated ratings and sponsorships until Ruth retired in early 1967. But aside from her on-air success, Ruth was a very private person, surrounding herself with only her closest friends and family. Arguably, her best friend was her sister Rose Lupton. In 1945, Ruth’s sister, Rose, gave birth to a daughter, Linda, and one month later Ruth and her husband adopted a baby girl, whom they named Candy. Being so close in age and without siblings, Linda and Candy literally grew up together. Both occasionally ended up on Ruth’s program, usually on the family oriented Christmas show and Candy briefly became a regular cast member. But fate was unkind to the family in the mid-1960s when Rose died of cancer, Ruth suffered a stroke and then Candy also died of breast cancer in 1966 at the tender age of 21. The tragedies and health concerns forced Ruth into retirement. Meanwhile, Linda grew up, married, and started a life of her own. 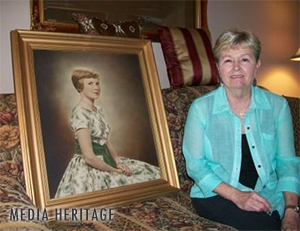 Eventually, Ruth gave Linda one of her cherished possessions, a large portrait of Candy that had hung in Ruth’s home. Linda treasured it ever since. Recently, Linda Hern lost her husband and worried about the fate of the portrait, so she donated it to Media Heritage, where it now hangs in prominence in the organization’s new library and research room. Young Candy, probably age 13 when the portrait was taken, will forever remind us of her life cut short, her mother’s incredible career, and a wonderful era of broadcasting that has passed into history.